To set the default search engine for your organization, follow the steps below. Users will be able to change the search provider after this policy is set. Paste the following text into a reg(*.reg) file. Navigate to User Configuration\Policies\Preferences\Windows Settings. 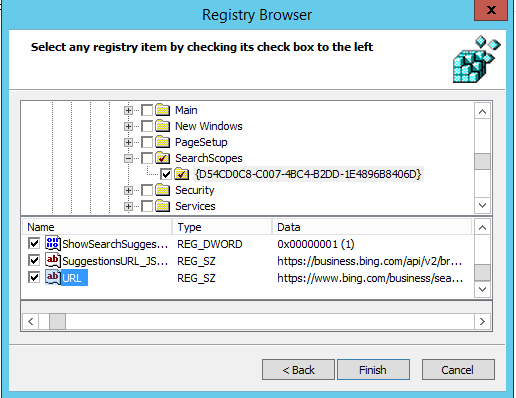 Right-click on Registry\New and select Registry Wizard. From the Registry Browser window, select Local Computer and click Next. From this key, make sure to select DefaultScope. Check all sub keys containing the GUID for Microsoft Search in Bing and every value under the key except any path to user profiles. Scroll down to select other items. Click Finish to complete this configuration. This warning is by design and alerts users of a program trying to modify their settings. 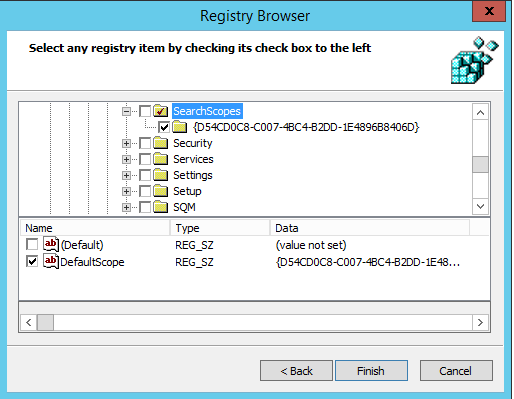 Within the same GPO, right click on Registry\New and select Registry Wizard. Navigate to HKEY_CURRENT_USER\SOFTWARE\Microsoft\Internet Explorer\User Preferences. Select the User Preference key. Click on the newly created object. On the right-side pane double click on the User Preferences object, change the Action to Delete and Save. For the latest ADMX files for various versions of Windows, see How to create and manage the Central Store for Group Policy Administrative Templates in Windows. Open the Group Policy Management Console (gpmc.msc) and switch to editing an existing policy or creating a new one. Navigate to <Computer/User Configuration>\Administrative Templates\Windows Components\Microsoft Edge. Chrome comes with its own set of group policy settings which can be downloaded in the form of an ADMX file from Google Chrome Enterprise Help. If operating systems Windows Vista/Server 2008 or later are used to manage GPO's for the domain, the ADMX file provided in this package takes care of Chrome settings on Windows XP SP2 or later. Make sure the following folders appear in the Administrative Templates section of both User/Computer Configuration: Google Chrome and Google Chrome - Default Settings. The settings of the first section are fixed and local administrators won't be able to change them in the browser. The settings of the latter section of policies can be changed by users in the browser settings. Double-click Enable the default search provider, and set it to Enabled. Setting the default search engine will add the Microsoft Search search suggestions feature in the browser address bar. Currently, this supports bookmarks only. Users will see the top two bookmark suggestions above public web suggestions as they type in the address bar.